Rampf studied mechanical engineering at Munich University and graduated in 1979, joining BMW immediately and beginning work as a development engineer, specializing in suspension, vehicle dynamics and testing work. He worked at BMW in Munich for 10 years before being posted to BMW South Africa in 1989. He stayed in Africa until 1993 but then returned to Munich and in 1994 was hired by Leo Ress - a former BMW engineer - to work with the Sauber team. 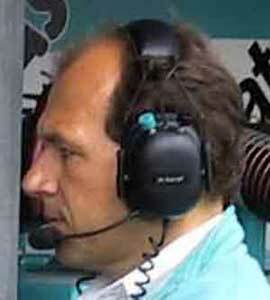 His job was to engineer Heinz-Harald Frentzen and he stayed with the team for three seasons before going back to BMW to work on the company's motorcycle research team and on a prototype motorcycle which was under development for use on the Paris-Dakar Rally.At the start of the 2000 season the Sauber team successfully lured Rampf back into F1 racing, appointing him chief race engineer with the job of overseeing Mika Salo and Pedro Diniz. He later took over as technical director.